We supply these fantastic promotional lipbalm tubes. Brand these great lip balm tubes with a wrap-around lable of your company logo and use them as promotional hand out items. Our moisturising and conditioning lip balm with Shea Butter and Vitamin E allows for high visibility branding. 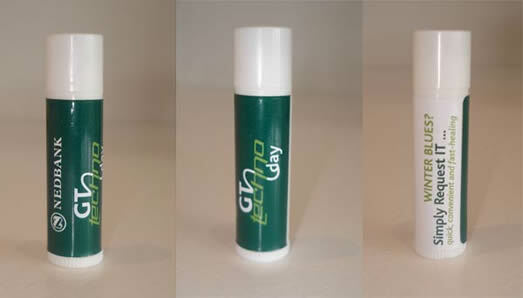 Lip balm is a daily use, unisex product that's kept in most handbags,cubbyholes, desk draws, pockets and bathrooms. So a promotional lip balm will put your brand into the recipient's intimate space on a daily basis. Lip balm's low cost, high perceived value as well as functionality makes it ideal for long term impact giveaways and promotions.